To start with, Creating a Live USB in Linux Distros is very simple.You do not need to download or install any tool for creating Live USB.For this purpose, all required is a USB(4GB recommended) and a .iso image of Linux Distro.By the way, Many tools available on the Internet too.Tools for Live USB in Linux Distros are like Linux Live USB creator, Universal USB installer.Creating a Bootable USB for windows, Download the tool WinUSB in ubuntu or in any other Linux Distro. Live USB and Bootable USB are very similar terms.The main feature of Live USB is TRY features of the Linux Distro.This can be done before installing it on your computer.Live USB and bootable USB term are used interchangeably. First, Download the .iso image of the Linux distro which you want to make Bootable USB. Second, A USB (Although most of the Linux distros size is less than 2 GB few have a size of 3GB so it is recommended to have a 4GB USB).You can also use Memory Card.The Memory card should of class 10. Plugin the USB into your computer. 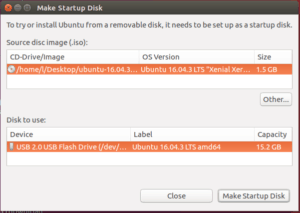 Click on search your and type Startup Disk Creator (if you are using Ubuntu).For other, go to Application option there you will find Startup Disk Creator option.Click on it. It will automatically recognize the USB.If multiple USB connected then select the USB needed to make Live. Click on Other option for browse to the location and Select the image. (if multiple images are present). It will show the following warnings and Click on YES. Then wait till the process is running.In fact, The process will take different time for different sizes distros. After a few minutes, you will have Bootable USB. Once the once the live USB is created, you can proceed with installation of Linux Distro.